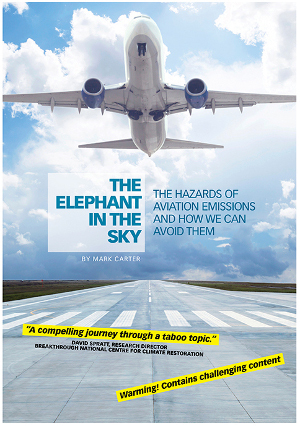 Welcome to the November 2014 edition of the Climate Action Moreland Newsletter. By popular demand! Candidates running in the state seats of Brunswick, Pascoe Vale and Broadmeadows are all invited. The federal government is failing us on climate change. We need strong, immediate action from a new state government to slash Victoria’s carbon emissions and protect our communities from climate impacts. See below for some important climate issues for the state government. Can you help us promote this important event? Invite your friends using facebook, or email them the details. We also need people to distribute leaflets and to ask friendly shopholders to display posters. Please contact us if you can help. Other candidates forums are being held in Moreland to discuss more general issues. See CAM calendar in the right hand column the right or here. What else can you do in the coming weeks to support climate action? Let’s end the great silence over climate change. Have you noticed that neither major party want to talk about climate change? Darebin Climate Action Now have been exposing the great climate SILENCE in Northcote. See Melbourne Times, John Englart’s photos and Facebook posting. Both Labor and Liberal candidates cancelled their appearance at the recent Fair Food Forum. This is of great concern, as climate change is expected to drastically affect food security. The Liberal Party’s cuts on climate action have been documented by Environment Victoria, so their silence is not surprising. But what about the Labor Party? We have looked through Labor’s policies and media releases and can’t find any new announcements on climate change. Yes, there are some policies on public transport, but there are so many more important climate change issues that Labor should be pushing. (We did find climate change discussed on page 80 of Labor’s 2014 platform.) So here is our message for the election. If you have any more ideas for ending the great silence over climate change, please email us your ideas or post them on our facebook page. We also need to talk about climate change with others in our community. 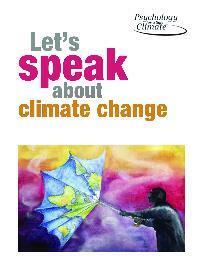 Psychology for a Safe Climate, have put out a great booklet called Let’s Speak about Climate Change. 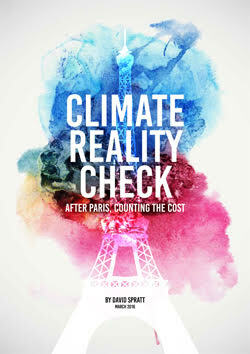 You can download PDF, or buy a copy. See also a report from the UK on Breaking the Climate Silence. 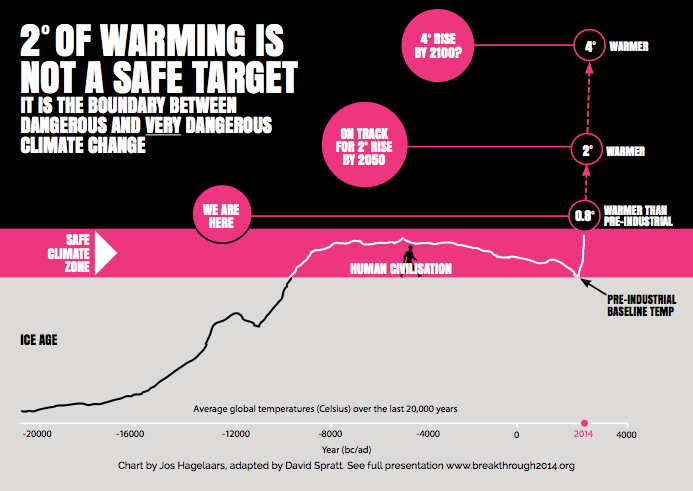 Also in this Newsletter: more climate news and events! The State Election is keeping us all busy. See our calendar of events. Lots has been happening in Moreland as well. 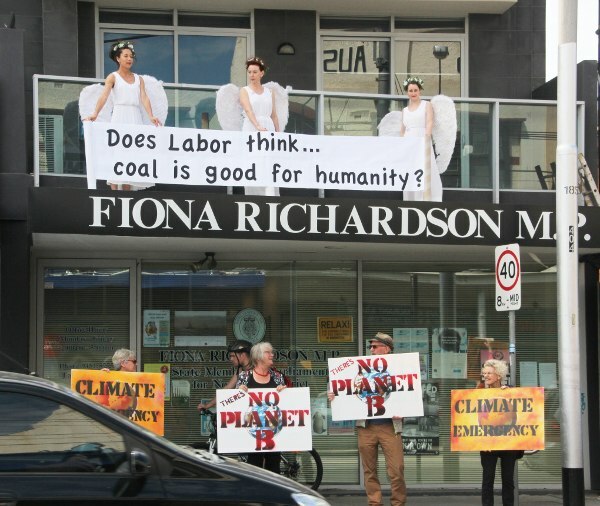 Climate Action Moreland meeting: Monday November 10, 2014 from 6.30pm. We are pretty chuffed! 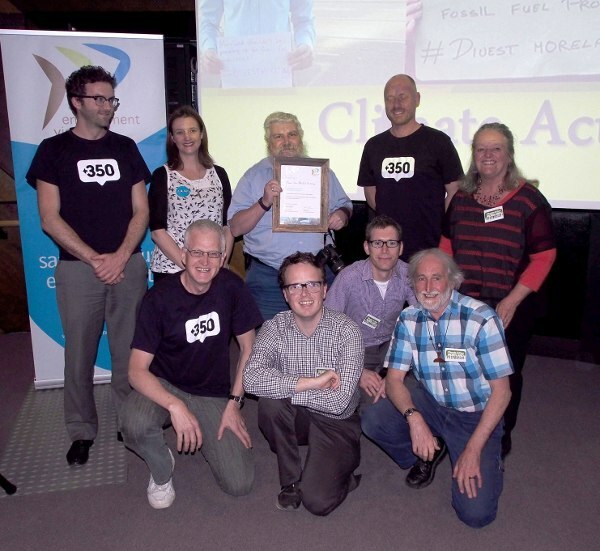 CAM and 350.org were recently presented with an award from Environment Victoria for our year long campaign to get Moreland City Council to adopt a process to divest from fossil fuels. More about the award here. Check out the other winners here. CAM and 350.org Melbourne have been urging the City of Moreland to divest from fossil fuels. Our campaign has borne fruit. In October, Moreland became the first council in Victoria to rule out direct investments in fossil fuels and the first council in Australia to start developing a strategy to move investments away from financial institutions that fund fossil fuel developments. More information on our website here. Thanks to the Moreland Councillors who voted for this: Crs Sue Bolton; Lenka Thompson; Lita Gillies; Sam Ratnam; Helen Davidson; and Oscar Yildiz. Thanks to community members who supported the campaign. 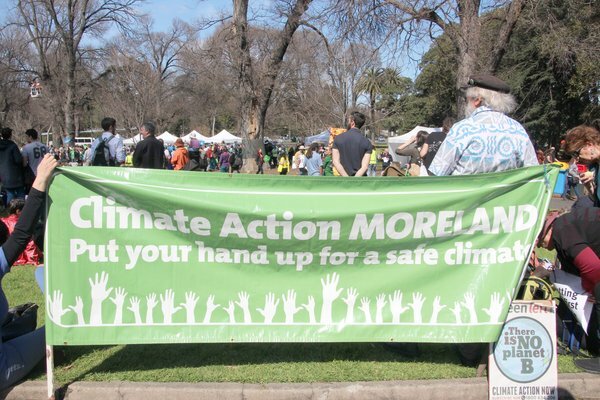 Climate Action Moreland and 350.org Melbourne are now being contacted by other community groups who are seeking our advice on how to get councils and other institutions to divest. We are happy to give advice. Please contact Michael. Can you install a Vote Climate sign in your front yard? 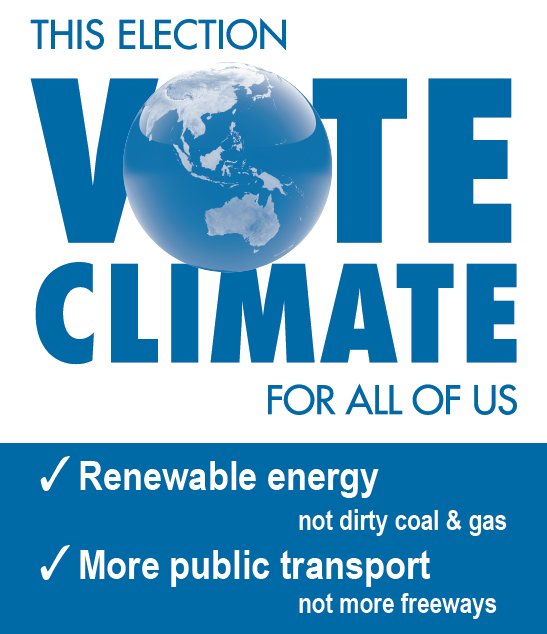 The Vote Climate campaign is not aligned to any particular political party. If you can help out, please contact Mark by email or on 0432 030 211. Moreland’s heat wave strategyClimate Action Moreland has been urging Moreland Council to take action to protect residents from the impacts of climate change, particularly heat waves. Thanks to Cr Sue Bolton for taking this issue up. At its last meeting, the Council agreed to adopt a series of measures to strengthen Moreland’s heat wave strategy. In particular, Moreland Council will be urging the State Government to treat heat waves as emergency events. See our full report here, and a review of heat wave management in Victoria. Cr Bolton will also discuss Moreland’s the heat wave strategy at a residents’ meeting on Nov 6, 7pm, Coburg Council Chambers. CAM had a stall at recent Fair Food Forum at Coburg Farmers’ Market. State election candidates were also invited to speak to discuss their policies on food security. All candidates standing in Brunswick and Pascoe Vale were invited. Labor and Liberal candidates both cancelled at the last minute. Candidates from the Greens, Socialist Alliance and Save the Planet were all there. You can see our report and recordings of presentations here. Moreland Council recently launched its strategy to reduce the Moreland community’s carbon emissions by 22% by 2020. CAM had some input into this strategy. See our report of the launch with videos of the speeches here and you can download the strategy here. 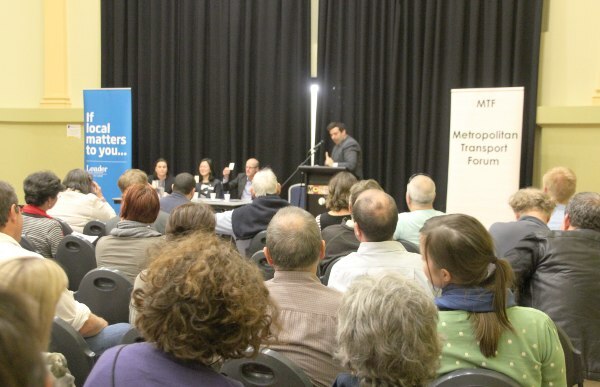 CAM members attended Moreland’s Transport Forum for Liberal, ALP and Greens candidates in the state election. See our report here. Our question to the forum was how the public transport system would cope with a much hotter climate, and how they intended to reduce the contribution that roads made to the urban heat island effect. Unfortunately only the Green candidate Tim Read seemed to appreciate that heat waves will be a major issue for Victorians in the coming years, and that our infrastructure will need to be able to cope with this. Clearly we need to do much more work in getting the major parties to grapple with the consequences of a much hotter climate. Our report has a summary of how heat waves are expected to affect transport infrastructure. For a 2011 study on Melbourne’s train system and its vulnerability to heat waves see here. Did you see CAM at the Climate Mobilisation on September 21? Here is our report. That’s only a start. We are sure you can think of plenty more issues! Come to our forum on November 17 to raise your issues with candidates. Click here for Facebook event. If you can’t come, email us with your ideas. Please promote this event to your contacts. See our list of all the election forums here. Entry filed under: campaigns, news, newsletter, Vote Climate. Tags: newsletter. 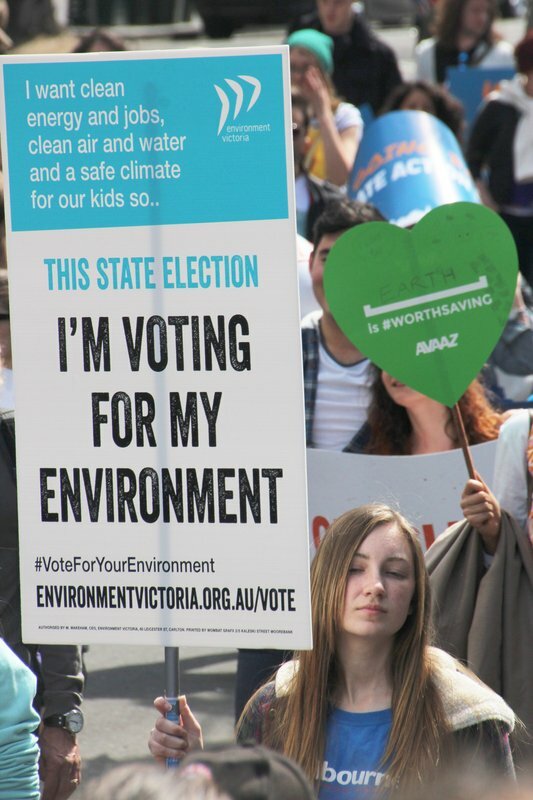 Our Divestment campaign earned us an Environment Victoria Award	Time for the Victorian Renewable Energy Target?